Produced by Anne-Cécile Worms, Variation – ArtJaws Media Art Fair takes place in Paris, France from 15 to 25 November 2017. Sedition is excited to present a display at the fair as part of a curated exhibition by Dominique Moulon. Variation, presented by ArtJaws, brings together practitioners of the digital arts from across the world in an exhibition which pushes the boundaries of digital aesthetics and feeds discussions around new media art. Performances, installations, innovative displays, screenings and roundtable discussions will transform the Galerie de la Cité internationale des arts in central Paris, while the accompanying Digital Week will extend that transformation out into the city. The event runs alongside Biennale Némo, the international biennale of digital art which is a citywide display of art and which runs from 17 October until 18 March 2018. Sedition will present a series of Art Frames and TVs showing digital limited edition works, selected by new media curator Dominique Moulon. Moulon is an art and technology historian focused on new media art and computer art and with a special interest in French digital art. His work deals with the techniques and aesthetics of digital art, and is particularly concerned with the influence of the digital on interactivity. He is the author of Art contemporain nouveaux médias (2011). Moulon’s work has brought his knowledge of digital art into contact with Sedition’s network of artists, resulting in a display with both conceptual and technical depth. The works selected by Sedition artists include _path/untitled9 by Mark Dorf, Unreal Estate (The Royal Academy Is Yours) by Lawrence Lek and These Rocks Won’t Lose Their Shape by Katie Torn, Rose Throb by Claudia Hart, and The Pink Train by AES+F. Elsewhere in the Galerie de la Cité, followers of Sedition will have a chance to see the 2016 video work Disco Beast by Jonathan Monaghan. 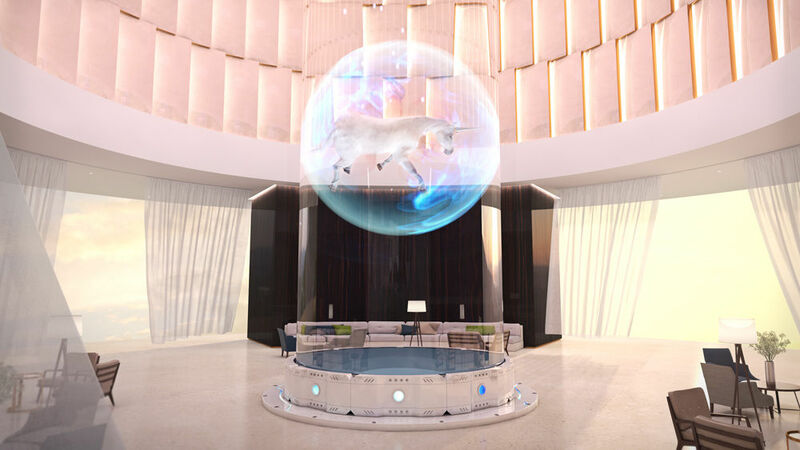 The 3D animated work combines elements from recognisable spaces - such as hotel lobbies and shopping centres - with a psychedelic floating unicorn to create a surreal uncanny vignette which also constitutes a comment on commercialism and fantasy.